All beans, except lima, are relatively easy to grow in New England. Beans should be planted in well-drained soil to reduce the chances of disease, and should not be repeatedly planted in the same field (rotate every two to three years) because of soil-borne diseases. Planting should commence only when soil temperatures have reached 60°F. Optimum seed germination occurs at soil temperatures between 70°F and 95°F for snap beans and between 70°F and 85°F for limas. Irrigation may be necessary at time of bloom in order to insure maximum pod set under dry soil conditions. Temperatures above 90°F or below 50°F cause poor pod set. Snap Beans: Snap beans include wax (yellow) and purple podded as well as green beans and are either bush or pole in growth habit. Pods are flat, oval, or round, depending on cultivar. Good commercial yields for fresh market are 200 bushels or more per acre. Lima Beans: Lima beans are of minor importance in most areas in New England. Seed germination and plant emergence are likely to be poor if they are planted before soils are warm (65°F or higher). The need to plant late and the days to maturity of available varieties sharply reduce length of the harvest season and restrict production in northern New England. A good yield of shelled lima beans is 3,000 lb/A. 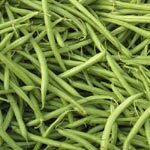 Dry Beans:In recent years, a significant acreage of pea beans and a small, but important, acreage of light red kidney varieties have been grown in northern New England. A good yield is 1,300 lb/A, but 2,200 to 2,500 lb/A is possible. Snap Beans: Plants should be spaced 1 1/2” to 2” within rows and 18” to 36” between rows. Use the higher plant population under a more favorable environment. Optimum growth spacing is about 36 sq in per plant. Sow 75 to 100 lb of seed/A (approximately 1/2 lb/100' of row) depending on seed type and percent germination. Plant seed 1” to 2” deep, depending on soil type and/or soil moisture content. Repeat seeding every two to three weeks for a continuous supply. Pole Beans: Pole beans can be supported by a bean trellis of a large mesh nylon material or large mesh wire fence. Removing the plants from the fence is a chore, however. Economics will allow disposal of the nylon mesh. The traditional manner is to use a four-pole “tepee” method. When using the trellis or fence method, plant seeds 1” to 2” deep, 6” apart, in rows 4’ apart. For the tepee method, plant six to seven seeds around each pole. One lb of seed will plant 240’ of row or around 150 poles. Lima Beans: Plants should be spaced 2” to 4” within rows and 18” to 36” between rows. Use 40 to 60 lb seed/A (4 to 6 oz/100' of row). Plant 1” deep in moist heavy soils and 2” in dry, sandy soils. Dry Beans: Plants should be spaced 2” to 3” within rows and 28” to 36” between rows. Rate of seeding depends on seed size, percent germination, time of planting, and row spacing (check seed company recommendations for each cultivar). Plant seed 1” to 2” deep depending on soil type and/or soil moisture content. Hand-picked beans are in demand. Piece rate or share picking (1:1) is suggested for payment. This can increase picker efficiency. Harvest beans only when the plants or pods are dry, to reduce disease and plant damage. Large snap and dry bean growers should investigate mechanical harvesters. Average yields are 4,000 lb/A (80 lb/100' of row) for bush and 2,500 lb/A (50 lb/100' of row). Dry beans should not be harvested until they have thoroughly matured. Let pods mature on the plants but harvest before the pods dry to the point of shatter. The mature beans should be so hard that you cannot easily bite into the seed.